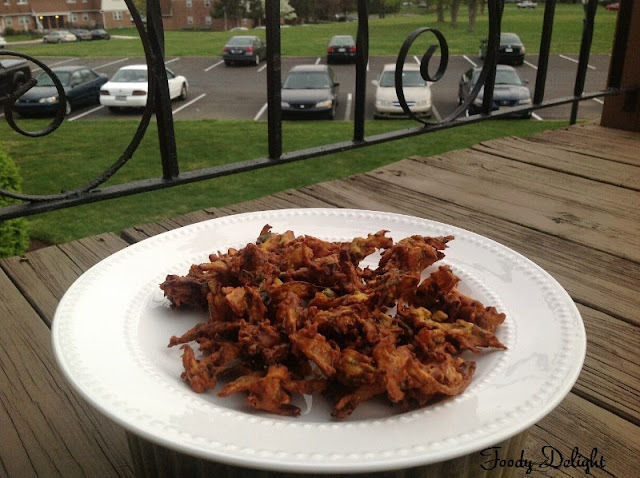 A common mouthwatering snack with a hot cup of tea is "Onion Pakoda". Common in Indian Subcontinent, this dish is equivalent of Western food nuggets and is almost loved by everyone. 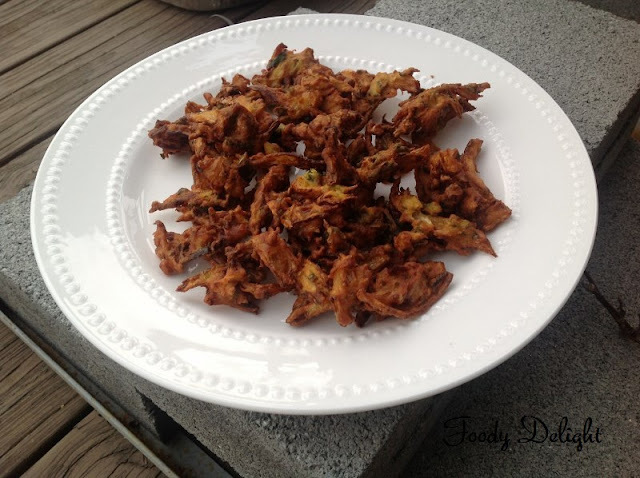 This dish is spicy, crispy fritters and favorite during rainy season.Onion Pakoda are the deep fried fritters made with onion, chickpea flour( besan) and some Indian spices. People have their own name to these fritters.But we call it as Kanda Bhaji, a popular roadside snack of India,enjoyed over a cup of tea or coffee. Finely slice all the onions. Finely chop green chillies, ginger and cilantro. Mix in the sliced onions. Mix all the ingredients in the large bowl by adding fennel seeds, ajwain, curry leaves,crushed roasted whole coriander seeds, a pinch of tumeric and salt. Then add rice flour and besan.Mix wll and sprinkle little water and form sticky dry mixture. Do not add more water, by adding more water you will not get crispy pakodas. 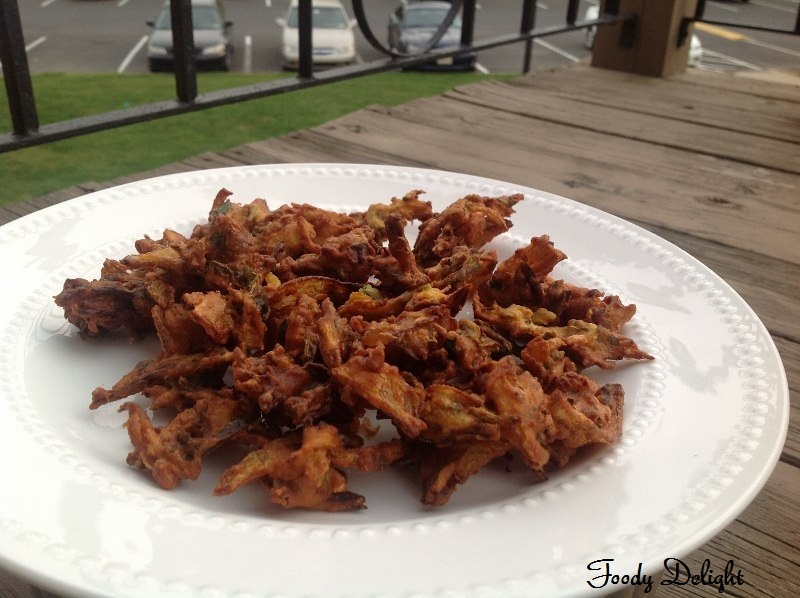 Heat the oil in the pan on medium flame and deep fry all the onion pakodas till they golden brown in colour. 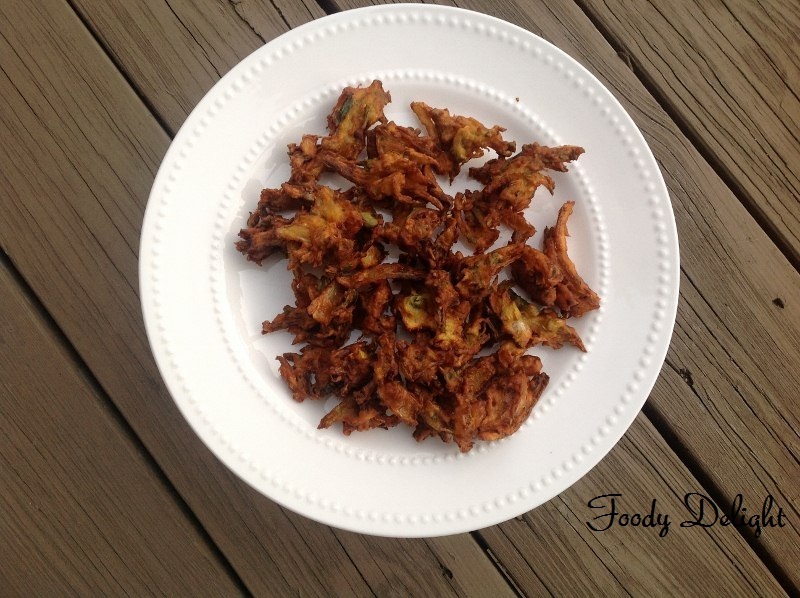 Onion pakoda are served with hot cup of tea or coffee. Fennel seeds adds more flavour to the fritters.Fresh mint leaves can also be added. Adding of hot oil into onion mixture, makes the fritters crispy and also prevents the fritters from getting soggy. A perfect teat time partner and you have made them so well. Hi Pranjali...I am happy to be your 100th follower! :-) I usually stick to sweet bakes but these onion fritters look really tasty! perfect snack along with a hot cup of tea! These looks so good! Thanks for coming over to my blog and leaving such wonderful comments.